Jon and I are heading down to Ocean City, Maryland this weekend to visit our good friends. We only get to see them a few times a year, so I'm very excited! The last time we saw them was in August and the visit was very brief due to a mishap with our Yorkie and another dog...if you'd like to read about that drama - click here. Our friends were so much help to us the last time we were there. We will be staying at their home this visit, and wanted to get them a little 'thank you' gift card to a local restaurant they frequent - Fager's Island. My Thank You card stash was low so I created a few using a new multi-step stamp set I received free with an order from Stampin' Up! Since I was going to use the same color ink for each step in the process, I decided to test the set out using two different inks: Stampin' Up! and Simon Says Stamp. 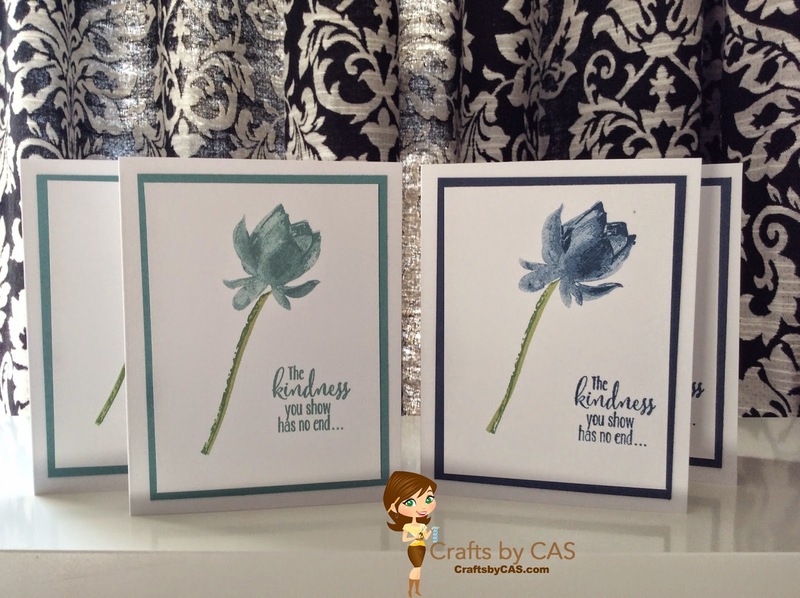 I have to say I prefer the result using Stampin' Up! ink for this technique. In addition to the flower, I also like the way the greeting on the front of the card came out. All preference, I guess. It's nice to have choices.